Denon DRA-100 review | What Hi-Fi? Part of Denon's Design Series, the £700 DRA-100 is essentially a handful of hi-fi separates – amplifier, DAC, streamer and Bluetooth receiver – all built into one stylish and compact box. All you need to do is add a pair of speakers. Reminiscent of the Cambridge Audio Minx Xi (a 2014 Award-winner that is now discontinued), you can play from almost any source – both streaming and wired – into the sleek DRA-100. As a compact, modern system that will fit right into your home, the Denon looks the part. The minimal, stylish exterior certainly lives up to its “Design Series” billing. The sleek black and metal casing with its curved edges looks smart, as does the large OLED display and volume dial. It’s well built too, so you’ll certainly feel that you’re getting your money’s worth here. You get plenty of information on that clear OLED display, from song and artist names to sampling rate and file type – all of which is perfectly legible. The responsive volume dial turns smoothly, too. Buttons are sparse on the front panel, which instead features a handful of touch-capacitive buttons for navigating your way around the Denon’s menu. They work fine, but they’re a bit limiting in actual use and besides, it's far more likely that you’ll be controlling the Denon using the supplied remote control. The remote is easier to use (especially when you’re sat on the sofa) and you can pick inputs and songs far more quickly. If you have a vast network-stored music library, we’d recommend downloading the Denon Hi-Fi Remote app on your iOS/Android smartphone, which simply gives you more space to scroll through songs and radio stations. It’s not quite the sleekest and fastest of apps, but it gets the job done. If we were to be asked the question, what can the Denon DRA-100 do, the answer would have to be “pretty much everything”. 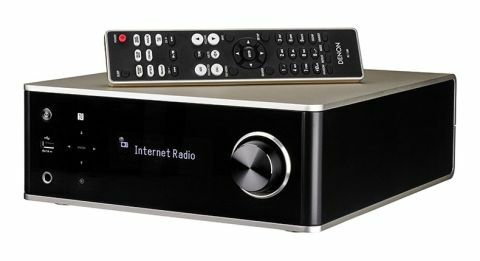 It’s an amplifier (specifically, a class D amplifier pumping out 70W per channel); a high-resolution DAC and streamer (capable of playing up to 24-bit/192kHz and DSD files over wired ethernet and wi-fi); and it can play wirelessly in a variety of ways, from Bluetooth and AirPlay to internet radio and Spotify Connect. When it comes to physical connections, there are plenty of analogue and digital options for connecting CD players, turntables and more. There are two line level RCA inputs, one coaxial and two optical inputs, a pair of analogue outputs, and a subwoofer out. At the front, you’ll find a 6.3mm headphone jack, and a USB port that will charge and play songs from iPods and iPhones. Really, the only big things missing from the DRA-100’s impressive arsenal of connections are a phono stage, a CD drive and a 3.5mm auxiliary input. But as far as streaming features go, the Denon is pretty well featured for a compact one-box system under a grand. An antenna is included for wi-fi, but for greater stability, we would prefer to go down the wired ethernet route. The DRA-100 connects to our network swiftly and immediately sees our two NAS libraries (you have to press Media Server input on the remote to start playing from them). It takes a bit of time to load up all the albums, and to play songs when selected on the app (the remote is quicker), but the stream itself is stable and never drops out during our testing time. We start playing Alt-J’s An Awesome Wave album, one of our favourite test room staples, and the Denon DRA-100 proves it’s more than just a pretty face. Clean, smooth and spacious – it’s a pleasing presentation right from the moment you press play. It’s not the most analytical sound we’ve heard, but there’s an easy-going approach to all songs – from every source and every resolution – that means you can keep listening for hours. The undulating tune in Breezeblocks comes across fluidly in a wide and open soundstage. Notes aren’t entirely crisp, but they’re not fuzzy either. Voices ring out clearly and sweetly, although we’d like more detail and solidity to the sound. The DRA-100 can’t quite convey Tom Wait’s growling, rasping vocals in a 24-bit/96kHz recording of Hell Broke Luce – it’s too polite to get across that snarling attitude. On the plus side, there’s no hint of flabby basslines or brashness around the treble regardless of what we play through it. You can also turn up the volume pretty loud without obvious distortion creeping in. That unfussy quality works well with lower resolution streams over Bluetooth and Spotify, too. While the Denon doesn’t shy away from demonstrating how well recorded Fleetwood Mac’s Rumours is, it also doesn’t snub its nose when you’re playing classic 90s alternative rock hits through internet radio. A bit more punch and precision would liven up the Denon’s sound immensely. Its pleasant approach is more appropriate for background listening, rather than getting your teeth stuck into what you’re hearing. The DRA-100 needs a more accurate sense of timing and subtler dynamics to really get the emotional depth and weight of Olufar Arnald’s Raein across. And songs such as Sbtrkt's Wildfire or Radiohead’s 15 Step need tauter basslines and punchier, controlled delivery to really make their mark. We’d like more insight from a £700 system, but the Denon’s smooth and clean presentation is pleasant, and a plethora of streaming features and connectivity, means you won't run out of ways of playing music. The DRA-100 is a nicely designed and well-featured compact system. If you're looking for something that's packed with streaming goodies, easy to use and sounds smooth and enjoyable, this box of tricks is worth an audition.